I’m having a craving for Kanom Kok, made the old fashion way of course. 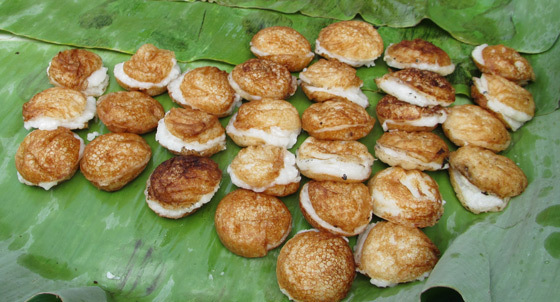 Not all Kanom Kok makers are equal and some of them use packaged flour in their recipe. If you are lucky enough, you’ll find a lady that still makes Kanom Kok the old way, like I used to seeing how it was made as a little kid in Vientiane. These rare kanom kok makers will grind their rice using the old tool and you can taste the difference. A good source told me this lady makes her kanom kok the old fashion way. I bought a batch and it was delicious and I will make a visit to her stall again if I am in Luang Prabang in the future. They look delicious. Gosh, I want some now. I can have a dozen of these.